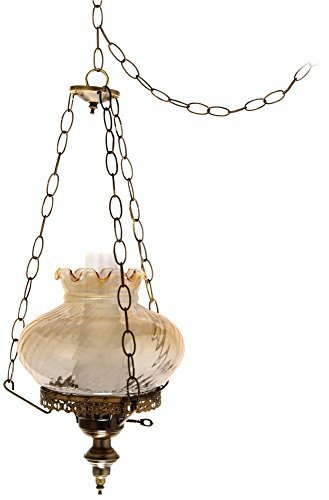 This beautiful antique-style swag chandelier is patterned after classic oil-burning lamps from the Victorian era and features a swirled optic amber glass shade surrounding a frosted chimney shade. Artisan made in North Carolina by Summit Lamp Company.- 24" high x 13" wide. 10" diameter shade.- Includes 12 feet of wire and 10 feet of chain. 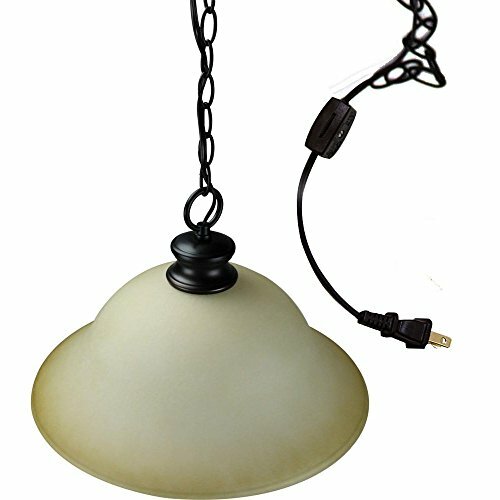 Sloped ceiling adaptable.- Takes up to 150 watt bulb (not included).- Plug-in Style.- Antique brass finish; swirled optic amber glass. This beautiful plug-in style swag chandelier is patterned after classic oil-burning lamps from the Victorian era and features a swirled optic blue student-style glass surrounding a frosted chimney shade. 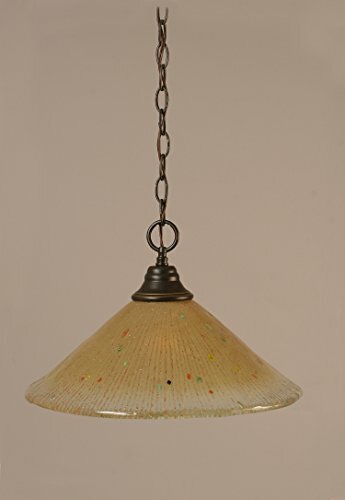 Artisan made in North Carolina by Summit Lamp Company.- 24" high x 13" wide. 10" diameter shade.- Includes 12 feet of wire and 10 feet of chain. 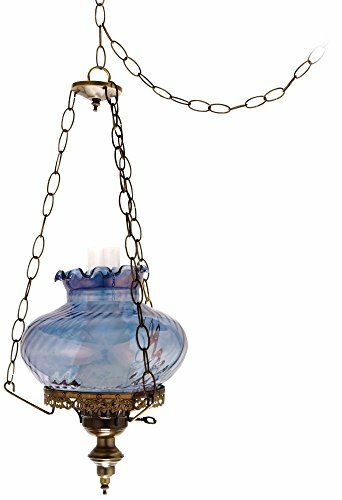 Sloped ceiling adaptable.- Takes up to 150 watt bulb (not included).- Plug-in Style.- Antique brass finish; swirled optic blue glass. 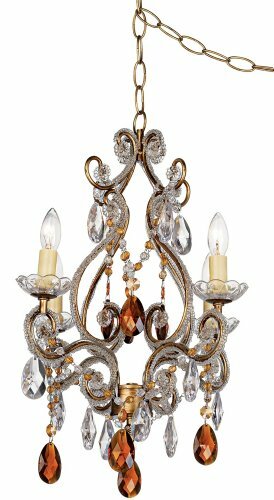 This swag style plug-in chandelier features a cascade of amber colored droplets and clear glass beads framed in antique gold finish. The draping of beads adds a magical touch to this sweet light fixture. The swag chain allows you to hang it wherever you want. No need to hard-wire, just plug this charming light into the wall.- 14 1/2" wide x 17" high. Round canopy is 4 3/4" wide. Includes 12-feet of chain, 15-feet of wire.Weighs 5.6 lbs.- Takes four 25 watt candelabra bulbs (not included).- Plug-in style swag chandelier, easy to install; can also be installed as a hardwired light, kit included.- A sparkling look from Regency Hill® brand. Sloped ceiling adaptable.- Antique gold finish frame. Glass beads and drops, acrylic flowerets. I am a plug-in Swag light! No electrician needed! Need a light in a hard to reach spot? We have your answer with this great swag lamp kit. In your box you get everything you need. Hardware, hooks, toggle bolts, etc. (except for the bulb). This kit comes with hardware to mount your pendant lamp into those hard to reach corners. Drape the cord to the nearest outlet and plug it in. It is that simple! Perfect for basement rec. rooms, laundry rooms, poker tables, or dorm rooms or anywhere you need extra light but don't want to mess with wiring. Features:Simple fashion design. Not only lighting but also decoration for your space. Creates retro, graceful atmosphere perfectly suitable for your decoration requirements. Easy installation and can adjust the height according to your perference.E26 lamp base, recommended Edison bulbs for better effects. 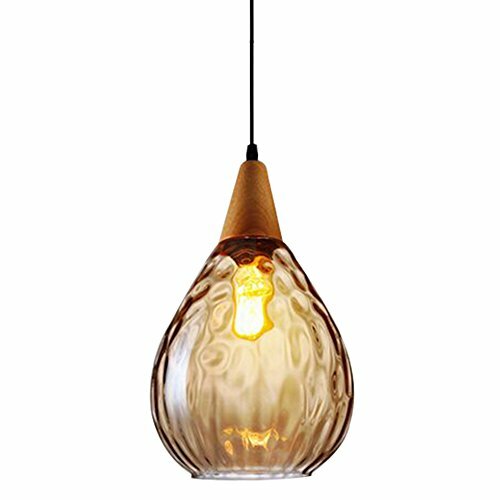 Application: Kitchen, Living Room, Dining Room, Bedroom, study, Coffee Shop , Restaurant , Bar etc.Specification:Item type: Vintage modern pendant lampsFixture Color: AmberSuggested Room Size: 10-15㎡Material: Jar wood.Number of Heads: 1Base type: E26Light source: E26 bulbs(Not included)Style: Industrial simplicity modernIs bulbs included: NoInstallation type: Pendant mountedWattage: Depends on E26 bulbsPower source: 110-130VPackage includes:1 x pendant light (bulbs are not included)If you have any question please feel free to contact us, we will provide satisfied sercives for you.Thanks for your support. Includes 10 ft. chain and 11 ft. wire. Bulb not included. Requires one 150 watts medium base incandescent bulb. Chain hung fixture. UL/CUL listed. Warranty: One year. Dark granite finish. Assembly required. 16 in. Dia. x 10.25 in. H (10 lbs.). 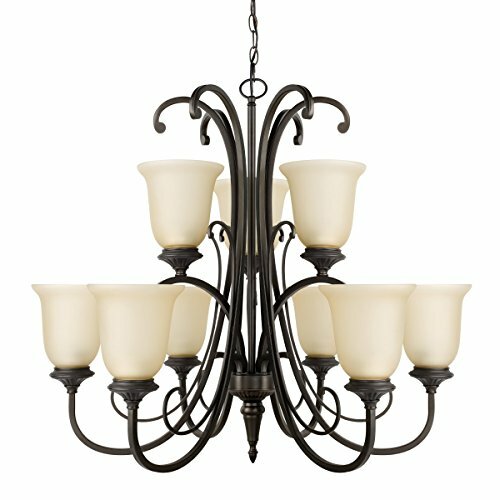 Our multi light swag chandeliers let you add designer lighting to any room. The special swag canopy installs into any ceiling junction box just like a normal ceiling light or chandelier. Install hooks in the ceiling and swag the chain to the canopy; adjust the hanging length as desired. With the hanging options, you can get the exact look and light placement you need. This version has a bronze finish 4 swag canopy. 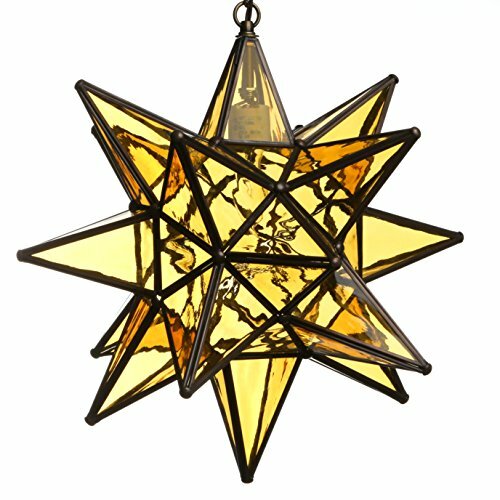 It features four amber art glass mini pendants with golden bronze finish and silver highlights for a wonderful look. 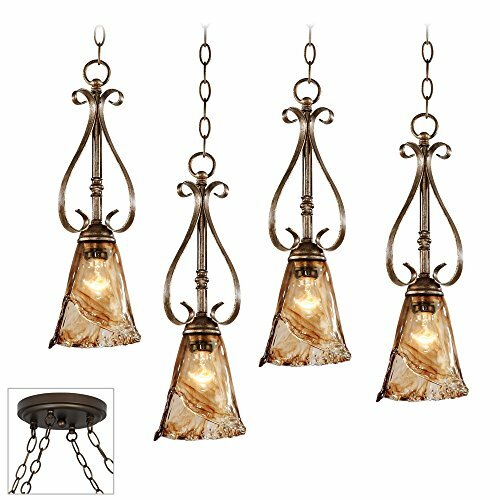 From the Franklin Iron Works swag light collection.- Each pendant is 19 1/2" high, 6" wide.- Canopy is 7" wide.- Each pendant includes 6 feet chain, 12 feet lead wire.- Four maximum 60 watt or equivalent bulbs (not included).- Installs into any ceiling junction box.- Includes bronze finish special canopy adaptor.- Includes swag hooks and mounting hardware.- Multi swag chandelier.- With four designer amber mini pendants.- Some assembly required; instructions included.- Amber Scroll art glass mini pendants from Franklin Iron Works.